Anthony Mackie’s Falcon is one of the best examples of Marvel Studios’ magic. Comics’ Falcon is a ludicrous character; a dude who can fly because he wears big metal wings, and also can talk telepathically to his best friend, who happens to be a bird. (His name is Redwing, if you’re curious.) And yet here Falcon is in the flesh (minus the bird chitchat, sorry Redwing) and he is not only plausible, he’s a compelling character and a badass hero to boot. A military veteran like Steve Rogers (Chris Evans), Sam Wilson strikes up a friendship with Captain America when they repeatedly bump into each other on their mutual jogging route. After Cap gets burned by SHIELD, Sam becomes the only person Steve can trust. Lucky for him, the only man he can trust just so happens to be a former paratrooper with access to an experimental flight suit codenamed Falcon. Mackie exudes just the right air of laconic cool and toughness, and he has an immediate rapport with Evans; their relationship is basically the superhero/sidekick ideal. And as goofy as the Falcon idea sounds on paper, Marvel’s designers and visual effects artists turned it into something believable and cool. There’s a lot of speculation that Steve Rogers is going to die at some point during Avengers: Infinity War or Avengers 4. (Evans himself confirmed this week that he’s pretty much done with Marvel after those two movies.) If that’s the case, one has to assume someone else is going to assume the mantle of Captain America, the same way characters like Bucky Barnes, John Walker (US Agent bay bay! 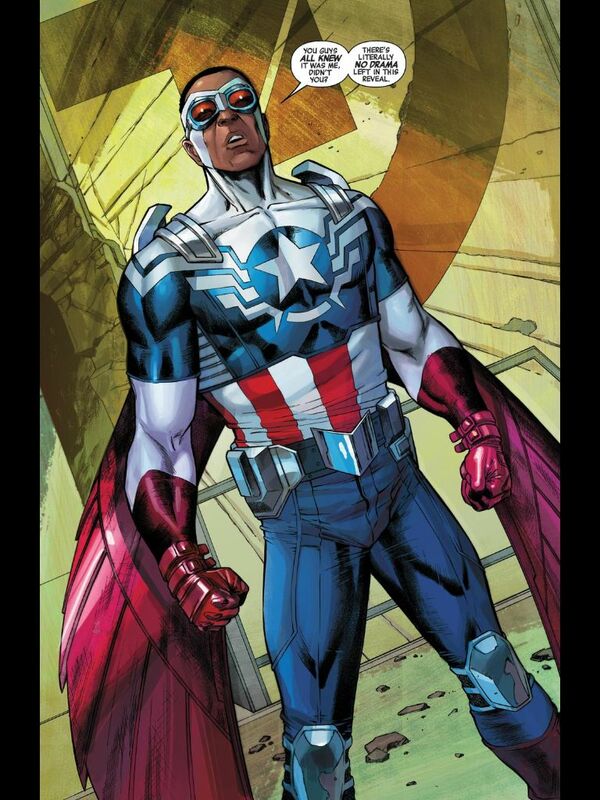 ), and Sam Wilson, have wielded that famous shield in the pages of Marvel Comics over the years. Given Mackie’s terrific performances as Falcon, he’s got my vote as the next Cap. I want to see this costume in action. One of the biggest talking points about The Winter Soldier was the casting of Hollywood legend Robert Redford as SHIELD boss and World Security Council member Alexander Pierce. Redford is a capital-s, capital-a Serious Actor and one of the world’s great champions of independent cinema in his position as a founder of the Sundance Film Festival. Snagging Redford for this key supporting role seemed like a major step in Marvel’s (or at least Marvel fans’) ongoing quest to prove the artistic legitimacy of comic-book movies. Surely an actor of Redford’s stature wouldn’t take a gig like The Winter Soldier just for the paycheck; he must have recognized this was a truly interesting film with serious issues at its core. Right? Right? Rewatching The Winter Soldier for the first time in three years, I was shocked to see how disengaged Redford seems from the movie around him. He never emotes, he never reacts; he never does anything, really, except recite his lines in a flat monotone that suggests he just learned them seconds before the camera started rolling. I guess you could defend some of his choices as a reflection of Pierce’s spymaster poker face. But even after his master plan is revealed and the poop starts to hit the fan, even as he’s shooting his housekeeper or ordering the deaths of millions of people, he remains as stoic and emotionless as Black Bolt. Redford’s casting bolstered The Winter Soldier’s credentials as Marvel’s homage to ’70s paranoid thrillers; Redford starred in one of the genre’s finest films, Three Days of the Condor. (He’s great in it, too.) This was another big Winter Soldier talking point. After eight movies, critics and even some fans were starting to note how samey every Marvel movie looked and felt. The Winter Soldier was supposed to be different; a gritty adventure full of dark conspiracies. The influences are apparent in the finished product, but the degree to which they made The Winter Soldier different from Iron Man 2 or Thor was way overblown. The Winter Soldier isn’t a ’70s paranoid thriller; it’s a Marvel movie with a couple of scenes where good guys turn out to be bad guys. But guess what? Good guys turn out be bad guys in almost every Marvel movie. (Like this one and this one and this one and this one.) That doesn’t make The Winter Soldier special; it makes it yet another variation on a theme. Maybe an interesting theme! But a recurring motif nonetheless. The Winter Soldier follows Steve Rogers and his allies as they uncover a massive conspiracy within SHIELD. It turns out that Hydra, the Nazi science organization headed by the Red Skull in Captain America: The First Avenger, survived World War II and infiltrated SHIELD in its earliest days. Since then, they have used SHIELD to secretly manipulate world events. So of course, after decades of what was apparently an extremely successful effort to covertly influence the course of history, they blow their cover straight to hell and reveal themselves in the most public way possible, by launching what’s called “Project Insight”: Three new SHIELD helicarriers that use advanced technology to predict and then eliminate anyone Hydra perceives as a threat. Fury’s line about the “up-close look” is an oblique reference to the scene in The Avengers where Loki’s minions attack the helicarrier, and Iron Man restarts one of the damaged engines by flying inside of it, which almost kills him. It’s just one line, and you don’t need to know anything about The Avengers (beyond the fact that Tony Stark invents stuff) to understand what’s going on. But if you are paying attention, it’s a clever Easter egg that works perfectly with the established stories and characters; of course Tony Stark would volunteer to upgrade SHIELD’s technology after it almost killed him. Being a Marvel fan usually enhances the experience of watching a Marvel movie. You get to savor the way characters you’ve loved for decades are translated to the screen, and enjoy all the little Easter eggs and references like Nick Fury’s line about repulsor technology (or the fact that Winter Soldier creator Ed Brubaker has a cameo as one of the men who mind-wipes the Winter Soldier after each of his missions). I wonder, though, if The Winter Soldier plays better for non-Marvel fans. The Russo brothers do a great job of building up the Winter Soldier as this terrifying threat without overplaying their hand. When his mask finally falls off and the viewer discovers it’s Cap’s supposedly-long-dead buddy Bucky Barnes (Sebastian Stan) it’s a great surprise. Unless you’re a Captain America reader, in which case, it’s exactly what you’re expecting, because it’s exactly what happens in Brubaker’s excellent Winter Soldier storyline. In this case, faithfulness to the source material comes with a price. That’s just speculation on my part based on the fact that of the nine MCU movies I’ve rewatched so far for this series, Captain America: The Winter Soldier is the first to look markedly worse in 2018 than it did when it was first released. It’s still a fun movie overall, and there are elements that really work, like the opening action sequence where Captain America leads the members of SHIELD’s “STRIKE” team in a raid on a boat that’s been taken hostage by French mercenaries. Chris Evans’ Captain America is an even more engaging presence as a man out of time (his list of things he missed while frozen remains a franchise highlight), and his refusal to compromise his hard-won values give The Winter Soldier a moral message and connect it back to movies like Thor: The Dark World, in their mutual consideration of what it means to be a hero. Unfortunately, the more you watch The Winter Soldier, the more you try to make sense of its SHIELD-is-Hydra subplot, and I’m not sure that can be done. It’s a shocking twist for the sake of a shocking twist; one that’s very hard to reconcile with SHIELD’s past actions in previous films. In order for it to work, you have to believe that Nick Fury, the world’s greatest spy and apparently the most paranoid person alive, worked for years (or maybe decades?) alongside people who were secretly plotting to destroy our country without ever suspecting their scheme. There are apparently a few good-guy holdouts, like Fury’s right-hand woman Maria Hill (Cobie Smulders) and Agent 13 (Emily VanCamp), an undercover spy posing as Steve Rogers’ next door neighbor. Otherwise, hundreds of seemingly upstanding public servants are secretly sleeper agents working for the disembodied computerized face of a 100-year-old Nazi — including the members of STRIKE, who are honorable enough soldiers for the overly moralistic Captain America to join their team, but so completely evil that they would turn on a dime and trying to capture and murder him, and then bury his body in a shallow grave. And then there’s Project Insight itself, which is both a still-timely commentary on our society’s ongoing debate about the extent to which we’re willing to give up our freedom for our security and a very convenient plot device. It’s introduced by Nick Fury, who isn’t working with Hydra, and he claims it’s very much something he wants, but it’s also secretly a way to instantly murder millions of people. So Project Insight is bad, but Nick Fury is good, even though he wanted Project Insight, but he didn’t actually know how evil Project Insight was, even though he’s the director of the organization that created it. Got it. Fury all but vanished from the Marvel Cinematic Universe after The Winter Soldier, so the series has never reckoned with his choices or how they affected his character, if at all. You can tell me I’m thinking too hard about this movie; that I should just turn off my brain and enjoy it. But that’s not how Marvel works. Marvel’s supposed to make movies that reward attention. If you want to catch all the Easter eggs and references and recurring themes, you have to be thinking about what you’re seeing onscreen. To fully enjoy The Winter Soldier you have to pay really close attention to some stuff, and willfully ignore other stuff. That is not how good conspiracy thrillers work.